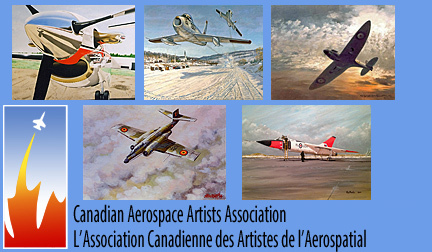 Artist Member: CAAA welcomes any visual artist or sculptor who has a serious and abiding interest in creating aerospace art and who seeks to develop their artistic skills. Artist Members receive the quarterly newsletter, AerialViews, and have the opportunity to display examples of their work, along with their contact information and a website link on the CAAA website. They have the privilege of having their work critiqued by award-winning CAAA Artist Members, getting the priceless benefit of comments based on the experience gained form a life-time in the field of aerospace art. There can be no learning experience more valuable to an aerospace artist at any ability level, and all for the small investment of an annual membership. Our conferences are held in different cities across Canada, usually in connection with an aerospace-related event at a museum or airport. These three-day conferences include lectures on art and aviation; critiques of work; open discussions on both aerospace and art-related topics; and visits to local aerospace sites, often featuring behind-the-scenes tours of areas not normally open to the public. Associate Member: Non-artists with an interest in aerospace art, including private art collectors, curators, historians, archivists, librarians, modelers, etc. can be involved with CAAA. As Associate Members they receive AerialViews which helps them to stay up-to-date with the latest developments in the Canadian aerospace art scene, including seeing new works by members and announcements of the times and locations of upcoming exhibitions. Although they can't display artwork at CAAA exhibitions or request critiques of their work, Associate Members can attend the annual conference where they can meet the artists, take special tours and attend lectures on art and aviation history. Institutional Member: Organizations or institutions such as publishers, museums, galleries, libraries, schools and aviation heritage groups support CAAA's efforts to improve and promote aerospace art, too. Their membership helps us promote aerospace art to the public and assists our members to improve their artistic skills through critiques, juried shows and competitive exhibitions for prizes. Several of our Institutional Members have requested invoices for annual renewal, so CAAA will now issue them every May 1st. Institutional Members receive the AerialViews newsletter and an annotated link on our Links and Resources page. To Apply for Membership - print and complete the CAAA Membership Application form and return it, along with payment, to the Membership Secretary (address on form). If you would like additional information, please do not hesitate to contact one of CAAA's executive members or regional coordinators listed on our contacts page. Current members can renew using this form. *Please note that these rates include an extra $2 charge to cover Paypal fees.